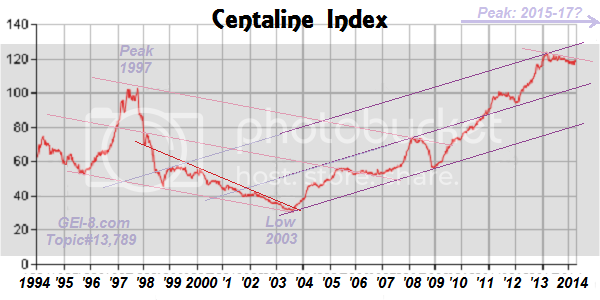 Hong Kong's "To-CL INDEX" RATIOS : A "Locational Measure"
"+ I try to analyze property markets within an 18 year cycle, which I have described elsewhere on this thread, and also on YouTube. It basically consists of 14 years up, and 4 years down - though these time frames can "morph" somewhat depend on the general economy and longer cycles. + I think HK is on its way into a Long Cycle top, which I am expecting in the 2015-17 time frame. You will note that: 1997 (most recent peak) plus 18 years is 2015 and 2003 (most recent low) plus 14 years is 2017. From these two calculations come my expected peak. 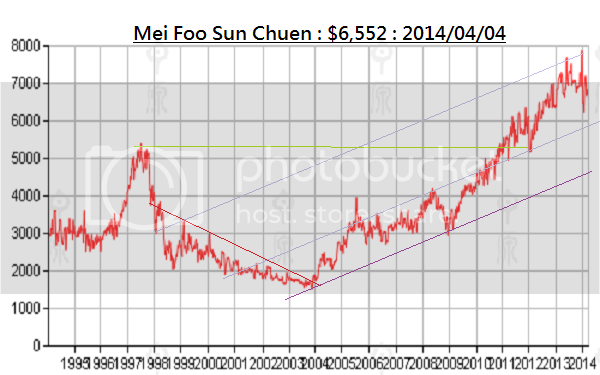 + Between now and 2015-17, theres is time for a decent correction, before a final "blowoff rally" into a peak around the time the Macau bridge may be finished, and when new MTR lines may be completed. These works may be give rise to excessive confidence and a final Long Cycle peak. (I am just guessing on this, but I would be monitoring how these projects effect confidence. + The "correction" that I am expecting might come from a jump in interest rates, as bond holders and others react to rising inflation, and force Central banks to lift interest rates. I think you will agree that a rise in HK mortgage rates to 2.5 - 3.0% (from present 1%) might bring at least a 10-15% correction in HK property prices. And it could be more than that, if rates go higher"
No reason to change any of that. 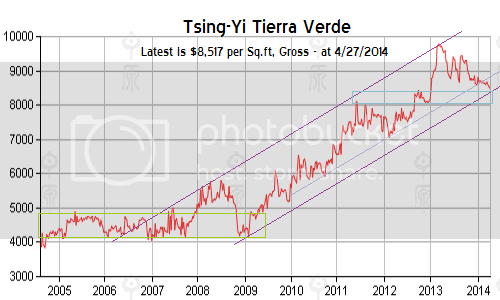 But we could see a premature peak, caused by those "cooling measures"
Location-: 5/25/14: Ratio- : End. '13: Ratio-- / End. '12: Ratio-- / End. '11: Ratio-- / Aver. ParkAveO : 11,594 : 97.37x : 12,325 : 103.5x / 11,161 : 96.40x / 10,147 : 105.0x / 101.7x : stable ? The number of private home completions in Hong Kong this year will reach its highest since 2004, the government said on Friday, further pressuring developers after a series of cooling measures forced them to cut prices. The number of flats forecast for completion in 2014 is around 17,610, a 113 percent increase from a year earlier, according to the city's Rating and Valuation Department. With a surge in new home supply and higher government duties to cool prices - which have soared nearly 120 percent since 2008 - competition to lure buyers could trigger even steeper discounts and further pressure developers' margins in one of the world's most expensive home markets, analysts said. ( Projected completions for 2014: 17,610, up 113%, but are back down to 12,660 in 2015. + Nearly 61% of the expected completions are in the NT, and especially Tsuen Wan, Tsueng Kwan O, and Yuen Long. + "In prime locations such as HK Island, they won't cut prices and would prefer to sit on inventory"
matter more than the Hong Kong person's historical bias in favor of the Island. The Ratios above, show how Robinson Place on Mid-Levels has slid, compared with the rest of the SAR. This is because of its superb connectivity, and the ongoing shift of Jobs away from HK Island. I think that MF's connectivity may already be "priced in", and other areas, which will benefit from shifts in Transport from New MTR lines and otehr transport infrastructure may be the big winners in the future. One area I like is Tai Kok Tsui (and also Kowloon Station to Nam Cheong) - which is a well built area (like Mei Foo was) that will be getting better transport connections. Perhaps banks had moved valuations BEFORE the Index Falls. Specific Flats ===== :: Tw3-30C: Tw3-30C: T3-30C : end Mo. 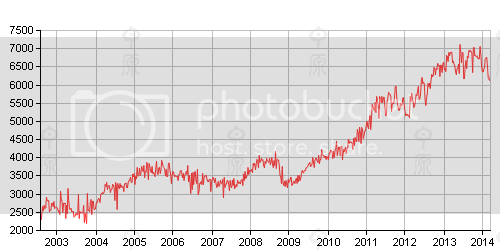 The Bank Values on specific flats (Tower 3, 30th Floor) are now ABOVE average CL Indices. And maybe that is justified by a higher than Average floor (? ), and/or better views. 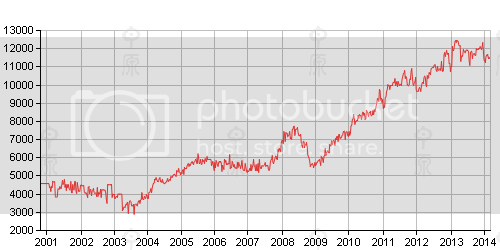 Interests:Investing - mostly Hong Kong and Antipodean equities and real estate. 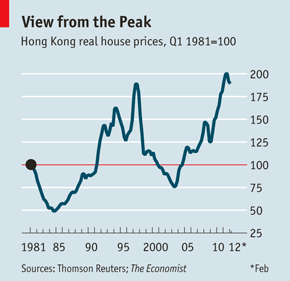 One thing I wish people would do when publishing charts showing HK property prices (or many other things) is to adjust them for inflation (or plot them on a log scale). It's implicit in the chart from The Economist that a Hong Kong dollar today is worth the same as a Hong Kong dollar in 1981. Obviously it is not worth nearly as much but by using the same dollar value it is misrepresenting the change in the real value of HK property over time. There are other issues with that chart as well. Agree with your comments on the number of completions and the relevance of access to he MTR in Hong Kong. The extension to Kennedy Town (which is already very accessable to Central) should make the area even more appealing. Does not look quite right to me. Location: 3/23/14: Ratio- : End. '13: Ratio-- / End. '12: Ratio-- / End. '11: Ratio-- / Aver. ParkAve : 11,478 : 97.93x : 12,325 : 103.5x / 11,161 : 96.40x / 10,147 : 105.0x / 101.7x : stable ? Location-: 5/25/14: Ratio-- : End. '13: Ratio-- / End. '12: Ratio-- / End. '11: Ratio-- / Aver.